Steve Webster is undoubtedly one of the greatest all-time sidecar racers but unfortunately his efforts go un-noticed to many as the sport is not publicised as much as it should be. However, you don't get an M.B.E. for nothing. Well done Steve for your achievements in the industry and keep up the good work. 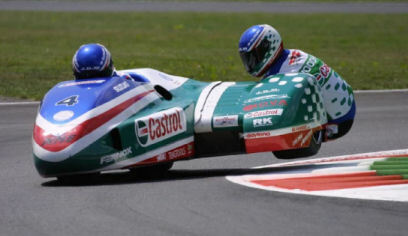 Team Castrol Suzuki’s sidecar racing legend Steve Webster M.B.E. has announced his immediate retirement from the sport. Amid emotional scenes at the Circuit van Drenthe at Assen, Holland on Sunday, the ten time World Champion announced he was going to hang up his leathers and helmet for good. His decision calls to an end a magnificent and unparalleled record-breaking career that has seen him rise from a 19-year-old club racer to the most successful sidecar racer in the history of the FIM World Championships. Steve 'Webbo' Webster MBE won 62 World Championship races on the way to collecting 10 World Titles in a career spanning 25 years from novice rider to the undisputed king of 3-wheels. 121 rostrum places from 143 finishes means 84.6% of Webster’s race finishes have been top three places. Steve has won nine World Titles, been runner-up four times, third three times and 4th twice. British Supercup Champions - 1989, 1992.